Hooked knives are the favored implement of clerics of Zaviz, the Dragon Prince of pain and ruin, to efficiently kill their sacrifices in their vile temples. This particular knife has been blessed with intelligence by Zaviz and has been given the purpose to inflict as much pain and torture in its killing. Legend says that it left its temple, long ago, after it convinced the high priest to slay all of his worshipers. It now uses its special powers to move from one weak-minded wielder to another,often convincing or deluding them into believing they are fighting some perceived danger.The knife takes great pleasure in leaving nothing but ruin in its wake. 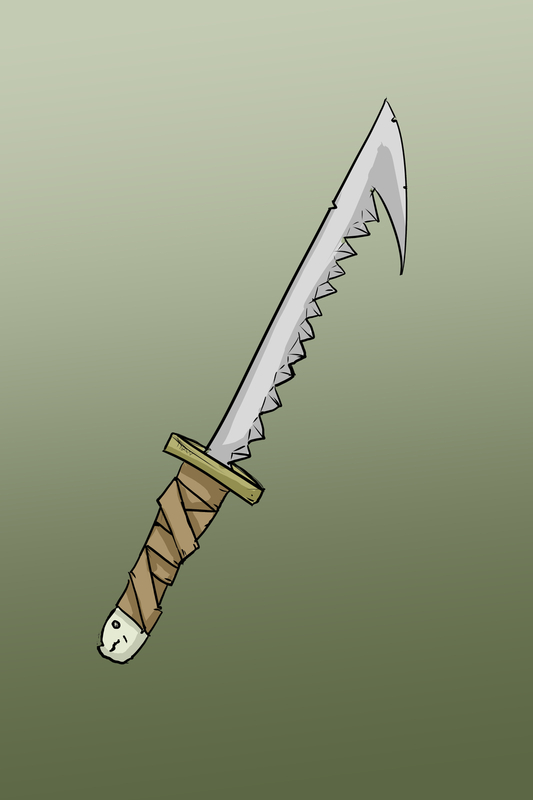 The blade of this +2 wounding hooked dagger (see below) is wickedly designed for maximum tissue damage with each thrust. The hooked tip allows for a piercing effect as it is stabbed in and pulled out. The jagged serration of the blade eases cutting through tough muscle and tendon. The hilt of the knife is made of bone wrapped in tanned skin. The Knife of Bloodlust rewards its wielder most when used relentlessly against a single target. When attacking a creature that is still bleeding from the Knife's wounding property, the dagger deals an additional +1 point of damage against the target for each bleeding wound the creature possesses (maximum +10). The Knife of Bloodlust is an intelligent item. It is very persuasive and will use its confusion and insanity abilities on its wielder if it needs to convince them to kill. The knife craves bloodletting. It is its sole purpose and any victim will do. This website uses trademarks and/or copyrights owned by Paizo Inc., which are used under Paizo's Community Use Policy. We are expressly prohibited from charging you to use or access this content. This websiteis not published, endorsed, or specifically approved by Paizo Inc. For more information about Paizo's Community Use Policy, please visit: paizo.com/communityuse. For more information about Paizo Inc. and Paizo products, please visit paizo.com.